It is our pleasure to announce the re-branding and WordPress website redesign of Rex Plastics, Inc. This project involved the redesign of the Rex Plastics corporate logo and company website within a strategically engineered WordPress environment. It was a blast for our entire team, and working in close collaboration with our client was a truly enjoyable experience. It’s easy to see how Rex Plastics has maintained a 98% customer retention rate over the past decade. After 40 years, it’s no secret these guys know what they’re doing. When it comes to custom plastic injection molding, Rex Plastics is the best in the Pacific Northwest. The enterprise is progressive, built on driving innovation with clients, but the website technology, design, and messaging had fallen out of date. When websites and the online presence of an enterprise falls out of date, this is known to damage brand credibility in cyberspace, especially with first-time website visitors. It’s difficult enough to help folks find your site, and making a poor first impression seriously impairs future business development efforts as these jaded online ‘searches’ will actively avoid brands who leave a bad taste in their mouths. For these reasons as well as others, MJGuilfoyle was commissioned to redesign the corporate identity and online presence of Rex Plastics in ways that showcase the organization as the highly capable, professional, family and community-oriented market leader it is. And we couldn’t be happier with the results. Rex came to us with an identity problem – they worried the brand may appear retro to potential new clients, when in actuality the organization is extremely progressive in nature. This was because the 3D block lettering of the logo (shown on the left), and the corresponding, dated styling and technology platform comprising the company website were creating an undesired brand ‘experience’ for a first-time client. First order of business; refresh the Rex Plastics brand identity to create a mark that suggests a certain connection with technology, a progressiveness. We needed to create a brand experience worthy of a market leader who has been around for 40+ years. We created the new mark (shown to the right) in an effort to capture the true personality of the Rex Plastics brand, drawing inspiration from past, present and future. We’ve also paid homage to the original crown element, since Rex means ‘king’ in Latin. As an additional layer to our logo refresh strategy, this new mark offers the ability to be used in alternate formats as an easily identifiable, stand-alone symbol. In the digital world, this symbol is very touch-friendly; it could easily become a button. For print, business and marketing collateral, the styling opportunities are limitless. Now, because of the inclusion of this highly visible symbol element within the logo, the name ‘Rex Plastics’ is not the only item synonymous with high-quality, US-based, custom plastic injection molding and mold-making. The circled, crowned ‘R’ symbol, shown to the left, will leave a stronger impression than words alone, collecting mass and gravity over time. To complete the updated brand experience, the refreshed corporate identity needs to be paired with a strategically engineered WordPress website, aligned to support business goals. As the foundation for Rex Plastics online presence enhancements, a world-class website was required to serve as the bedrock from which to launch additional, supportive Internet strategies. While the previous site contained deep pockets of useful information, it was difficult to discover and digest, especially when viewed from mobile devices. Copy had also fallen out-of-date because our client was previously unable to make simple content updates within the aging framework. Additionally, search engine optimization (SEO) and website traffic gained by organic search was very important to our client, and recent website traffic statistics were showing decline. Creating a more user-friendly, Google search-friendly website was a must if Rex Plastics hoped to harness the Internet in ways that help the business, as opposed to damaging it. I could not be more satisfied with my experience with Mathew and MJGuilfoyle. His vision for our new website was spot on and he consistently incorporated that vision throughout the entire project. He and his team were not afraid to voice their opinion to me even when they disagreed, and had creative solutions to every obstacle that came up. I would highly recommend Mathew for your online presence enhancement. -Rich Clark | President, Rex Plastics, Inc.
Because WordPress is extremely user-friendly, Rex Plastics is able to allow non-technical business staff the ability to make site content changes within the custom design we created. Learn more about the many different types of value delivered by the WordPress content management system, here. Because the mobile audience is important for so many reasons, we prioritized the mobile user experience when designing the site. If it didn’t work for mobile, it didn’t make it in the final design. A responsive design framework not only helps to provide a better mobile user experience, it ensures the website is positioned to comply with Google’s Mobile Friendly Update. Beginning with the April 21, 2015 Mobile Friendly Update, Google search now penalizes websites that are non-mobile-friendly. While mobile considerations are definitely important, because the large majority of Rex Plastics’ ideal customer base are business users who likely spend a large amount of time using full-size displays, we leveraged full-screen video to create an immersive, authentic online experience to create an undeniable, lasting impression with website visitors. When visitors arrive at rexplastics.com, the site doesn’t force them to squint and begin reading. Instead, visitors immediately ‘experience’ the brand, witnessing the moving pieces of the production floor in time lapse video, the collage of equipment, in-action, making parts. We literally give first-time site visitors a seat in the rafters of the company facility, watching the team work before considering engagement for potential business. The use of original, authentic video and imagery helped us feature Rex Plastics as they truly are, and expressed a desire to be seen as; real people who work hard and care about what they do. Websites should first and foremost be a joy to use. By speaking directly to the ideal customers of the brand, we empower visitors to choose a highly visible path within the website, speeding access to information in a simple fashion while connecting with a diverse audience. 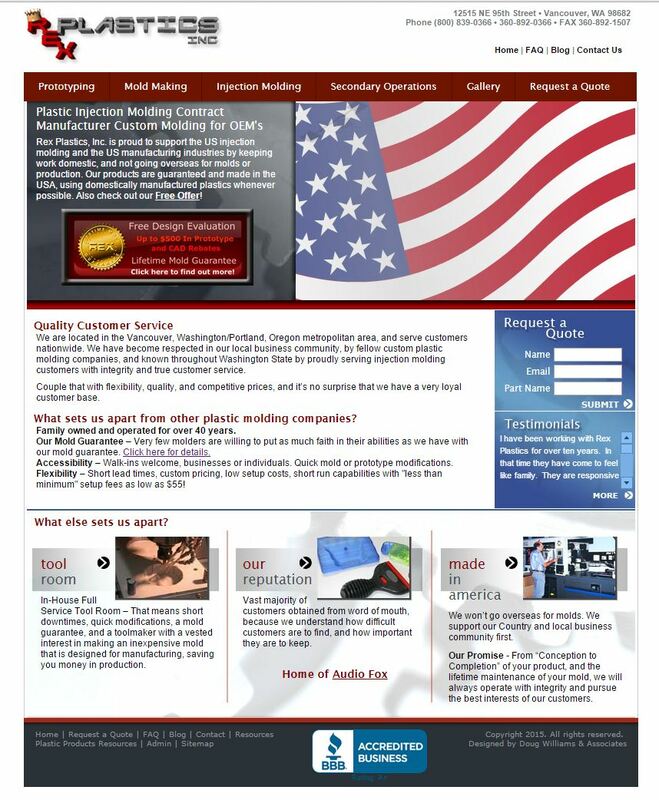 The challenge of featuring strong, concise messages within a mountain of content is not unique to Rex Plastics; many websites active today struggle with the issue of effective storytelling. By telling strong stories focusing on the things clients value most, we are able to capture the attention of site visitors. By leveraging interactive elements within the site design, we are able to showcase large sections of text copy in bite-size pieces, easily digested, and mobile touchscreen friendly. While all projects and clients are unique with each receiving the level of scrutiny and attention to detail they deserve, many are rooted in a similar foundation that has been described above. MJGuilfoyle specializes in creating comprehensive Internet strategies, each uniquely crafted to support client business models and budgets. Contact a member of our team to begin creating your unique Internet Technology Plan today. For small business owners, it’s often difficult to get started blogging. Scary, even. What will you say? What will people think? And, how do you know if you’re doing it correctly? Worse yet, what if your efforts actually hurt the business, rather than help it? This is cyberspace, after all – everything is indexed and saved somewhere, right? Valid questions, each and every one. In this article, we won’t get too far into discussing the business value of a well-executed blog strategy. The many benefits and types of value delivered from a properly organized and professionally curated blog have been proven and reported on for years by trusted experts. For example, check out these crazy stats on the value of business blogging. Additionally, B2B companies with blogs generate 67% more leads per month on average than organizations that choose not to blog. Still not convinced? Forget about those stats for a minute and think about sharpening your sword. Instead, we’re going to assume you’re ready to rock, and jump right into helping you author your first, original, authentic, enticing business blog with confidence, focus, and yes – even a little swag. Why am I in business, or why does my business exist? Why are we different, and where is the value to our customers in our differentiation? Tip: think bigger than merely describing what your business does. Challenge yourself to think about why you exist in a market full of competitors. Example: MJGuilfoyle exists to help small businesses thrive online. We intend to provide levels of quality, service, value and professionalism normally reserved for enterprise-level customers (and budgets) to startups as well as small and mid-sized businesses that are ready to switch gears and truly compete online. Because of this simple exercise of starting with why, I now understand ways in which my blog should be aligned with the purpose of the business, existing to help those same target audience members thrive online. The blog needs to provide valuable information related to Internet strategies that will help the clients I serve. It needs to function as the voice of MJGuilfoyle when a human being isn’t involved, and it must perform well in this capacity. What are a few pieces of value you’d like to offer readers of your blog? What would you like to get out of your blogging efforts? Tip: think on both business and personal levels. It’s okay, you deserve a cookie, too! Who is your customer\audience, really? Can you describe your customer\audience using various personae and demographics? What sources, and what type of content do you anticipate your customer\audience currently consumes? Tip: make a list of these sources as they will become trusted influencers you can lean on for future blog inspiration, referencing\linking within your articles, etc. Even though this item appears as step 4 on our list, establishing (and committing to) a realistic posting frequency for your business blog is of primary importance. Why? Ever have an anticipated snail mail letter, or parcel, fail to be delivered on the expected day? Man, what a jip, right?! Now imagine that happening again and again, playing-out sporadically each week in the coming months. Eventually, you’ll stop checking your mailbox and your feelings toward that sender (or carrier) are most likely tarnished forever. Monthly blog frequency is a good entry point for solo bloggers and small teams without full-time content creators. Those lucky enough to have more resources available for blogging should consider twice monthly, or even weekly blog articles. Many organizations are finding ways to allow employees to contribute to blogging efforts. Consider how a ‘divide and conquer’ blog authoring strategy may help your specific blog posting goals, as well as improve the culture of your organization. Your business exists to be different than the competition, and the voice of your blog should not be afraid to represent this. Be original and authentic, while always remaining professional in your approach. Within the boundaries of good taste, don’t be afraid at times to experiment with grammatically imperfect passages to emphasis statements, creative pauses, and even humor that connects with your audience. Don’t shy away from blogging in the native tongue of your brand, sharing internal terms and mantras that help your business and teams succeed. If you are proud of your brand, your people, and your processes, show them off to your blog audience. If executed properly, while your grade school English teach may freak out with that darn red pen, these endearing techniques leave a lasting impression on your audience, searing your ‘voice’and company culture more effectively within the minds’ of the readers of your blog, tempting more engagement activities as well. So, remember – you be you, always, within the boundaries of good taste, remembering your are creating a professional business blog, and you are representing your brand. While all business blogs are unique, each can benefit by adhering to the simple strategy for blog success that has been described above. MJGuilfoyle specializes in WordPress website development and online presence management services for small businesses. We create comprehensive digital strategies, each uniquely crafted to support the business models and budgets of our clients. Contact a member of our team to begin creating your Internet Technology Plan today. We are extremely pleased to announce the recent launch of bierlyandrabuck.com, a strategically-engineered WordPress website created in close collaboration with our clients, attorneys Denise Bierly and Bobbie Rabuck from the law offices of Bierly & Rabuck. With goals of harnessing the Internet to help their new partnership, Denise and Bobbie contacted MJGuilfoyle to devise a unique digital strategy aligned to support the values and purpose of the practice. Bierly & Rabuck is a Pennsylvania-based law practice comprised of nationally recognized attorneys with decades of legal experience who have distinguished themselves in the ares of adoption, gestational surrogacy, guardianship, and child advocacy. Concepts of community, warmth, and professional credibility were paramount design considerations, as Denise and Bobbie are passionate advocates of the children and families they serve. We needed to find ways to truly connect with site visitors through shared sentiments of child advocacy and family dreams. As the bedrock of the newly-formed Internet Technology Plan, a world-class website was required to serve as the foundation from which to launch additional, supportive Internet strategies. These vital, ongoing, supporting activities, such as blogging and social media management, are strategically included within the Bierly & Rabuck Internet Technology Plan as key initiatives to generate valuable, original content, establishing their voice as experts, cultivating online communities that will help the practice better serve and connect with clients and prospects online. Because the WordPress content management system is extremely user-friendly, Denise, Bobbie and their team are equipped to manage and maintain website content within the beautiful, intuitive design layout we’ve created. By equipping non-technical business users with the ability to edit website content, we’ve set a plan in motion that ensures the language of the site is always current, relevant, and aligned to the evolving practice. What good is a website if the language isn’t aligned to the business? Learn more about the many strategic benefits of WordPress, here. Connecting with site visitors begins with effective storytelling. Concepts of child welfare and the prosperity of families is paramount to the daily activities of Bierly & Rabuck. This shared connection must be established between the site and visitor. Inspiring imagery, language, and presentation methods are used together in collaboration to form a stronger bond with site visitors. First impressions matter. If a website isn’t a joy to use, people won’t use it, and those folks will actively choose to avoid the site in the future. You’ll notice bierlyandrabuck.com displays differently when viewed from a full-size display, tablet, or smartphone. This is because the layout features a responsive design, presenting content in an optimized fashion for all site visitors regardless of viewing device. The value of investing in responsive design will pay greater dividends over time as data shows more than 30% of global Internet traffic comes from mobile devices, a trend that will continue to climb well into the future. Interested site visitors will have a general idea of their path for discovery once they reach this website. By offering highly visible, actionable paths (by Practice Area), we empower site visitors to research and consume content in an intuitive manner. Empowering site visitors to uncover this information on their own also offers efficiency gains in operations for the Bierly & Rabuck team. Highly identifiable call-to-action buttons are offered to present clear, actionable choices to website visitors. Social connectors are visible in a muted fashion in various locations, so site visitors can choose to visit, browse, and connect with the practice in new ways. Webforms supporting client onboarding, per Practice Area, are connected to a simple customer relationship management (CRM) solution, easing the administration strain of managing client relationships. Clickable email and phone numbers are present throughout the site. Why is this important? Many reasons, but consider clickable phone numbers for mobile…isn’t it great to offer your mobile website visitors the ability to press-to-dial your office at various locations within the design layout? While all projects and clients are unique with each receiving the level of scrutiny and attention to detail they deserve, many are rooted in a similar foundation that has been described above. MJGuilfoyle specializes in creating comprehensive digital strategies, each uniquely crafted to support client business models and budgets. Contact a member of our team to begin creating your unique Internet Technology Plan today. Have you considered offering social login functionality to your website visitors? Social login, aka ‘social sign-in’, is an adapted form of single sign-on that uses existing login information from a social networking platform (like Google+, Facebook, Twitter, LinkedIn, etc.) to sign into a third party website. This feature is generally offered to website visitors as an item of convenience, since it bypasses the need to create another unique account to facilitate login activities specific for the site. For the business, offering social login to website visitors provides many benefits as well. For example, providing the convenience of social login to first-time visitors has proven to create more conversions (new accounts), connect more closely with audiences, and capture additional information beyond the traditional user account and password creation process. Janrain, the Portland, Oregon-based social login business pioneer and social-login-as-a-service trailblazer since 2008, recently published an excellent report detailing Q4, 2014, as well as cumulative social login user statistics (collected since late 2009) revealing many interesting discoveries and continuing trends. Data has shown that social login is absolutely understood by consumers, and is becoming a preference for many. The janrain report, 2014 Consumer Research: Social Login and Personalization, shows that 90% of the polled audience indicate they have seen social login as a feature for a website they’ve visited, and of this 90% more than half of those people use it. Additionally, 43% chose Facebook (-3% from Q3) and 40% chose Google+ (+6% from Q3) as their preferred social login platform. To read more about these social login trends, please review the full janrain blog article, here. At MJGuilfoyle, we believe in the power of convenience and the future of social login functionality for websites and apps of all types. At the highest level, the debate is very simple – ask yourself how much you enjoy (or dislike) creating unique accounts required for a particular website or app, and how much of a pleasure (or pain) it is to manage that item. Additionally, with the business value of social media becoming easier to understand and prove than ever before, we know it is imperative to connect with customers through these channels. By offering visitors the opportunity to interact with digital products using these established social media accounts (that they’ve grown quite fond of, mind you), goals are accomplished for both the customer and the enterprise, making this a win-win opportunity, and sound rationale for a technology investment to build social login functionality into the front-end of your company website. We’d love to hear your thoughts – what do you think? MJGuilfoyle, a Portland, Oregon-based strategic web agency, recently released ppdbuild.com, a strategically-engineered WordPress website that was brought to market on an exceptionally quick project timeline, at an affordable budget, and with an undeniable level of professionalism required to function as the digital face to the world for a young brand with objectives as progressive and refined as those sought by PPD Interiors Corporation. With goals of leveraging the Internet to help the organization acquire new business, create momentum, and achieve early success, PPD Interiors Corporation contacted MJGuilfoyle to create a digital strategy intended to uniquely support the organization during a startup phase. PPD Interiors Corporation is a full-service general contractor serving Chicago and the surrounding suburbs. The company was built on a philosophy that prioritizes recruiting the strongest construction service professionals who hold themselves to the highest standards, operating with integrity above all else. The process-driven approach of PPD Interiors Corporation has proven to produce top-quality projects delivered on-time and under budget while exceeding client expectations on all fronts. In the highly-fragmented general contractor market, these ideals are differentiating for the business, and the primary message that must be conveyed to current and potential customers through any marketing efforts, digital or otherwise. Serving as a solid foundation MJGuilfoyle worked in close collaboration with key stakeholders of PPD Interiors Corporation to strategically engineer an Internet Technology Plan, aligning the business with key Internet technologies to forge a critical path forward during this period of brand infancy. Serving as a granite foundation to support additional, aligned, Internet technology-related initiatives, the leading edge of the Internet Technology Plan for PPD includes a polished, professional, marketing-centric website designed in ways intended to establish instant credibility with first-time website visitors by appropriately representing the ideals and aspirations of the PPD Interiors brand. Wait, did I mention we delivered this on a three week project timeline because the client was actively working to close major deals? We nailed it. When browsing the ppdbuild.com site, you’ll notice a strong presentation of PPD Interiors ‘Why’ statements (People, Process, Delivery), an ‘Our Purpose’ statement located on the footer to follow the visitor through all pages of the site, and the use of striking professional imagery to instantly connect with audiences. Much can be achieved through simplicity in design aesthetic, and ppdbuild.com is an excellent representation of this often under-utilized design technique. With more than 60 million active websites utilizing WordPress today, PPD Interiors can rest assured their investment in technology will have longevity. The enormous, active WordPress community presents value in numerous ways including the availability of fully-functional, free tools like plugins and themes, as well as access to a broad and deep developer network if they would ever choose to work with someone other than our agency (which we hope they never do!). A professional WordPress theme featuring responsive design functionality was used as a base for this project to speed time to market and lower project costs. Why spend money to recreate the wheel? Learn more about the value of the WordPress content management system (CMS), here. Highly visible, strategically located ‘Contact Us’ buttons are presented throughout the site. Clickable email and phone contact links provide simple, valuable usability benefits at all viewing sizes. Social connectors, mid-page as well as footer locations, ensure clients and potential clients recognize the availability of PPD Interiors online communities, and feel welcome to join. Responsive design, especially within the ppdbuild.com design layout, offers a truly optimized user experience regardless of viewing device. Mobile navigation ‘hamburger menu’ is push-friendly, appropriately sized for a human fingertip. Each section of the homepage features a call-to-action of some type, ensuring a vertical presentation that requires scrolling (ex: smartphone) provides the site visitor opportunities to connect whenever they may choose to, without requiring they scroll up, or down to find that ‘darn phone number, email, or contact button’. As a major differentiator for the business, original copy was created supporting PPD Interiors mission, purpose, and ideals. We worked together to focus on the ‘Why’ of PPD Interiors Corporation, and came up with some really great stuff. An appropriate balance of professional stock imagery and actual photos of various team members is featured to provide a well-rounded presentation. The homepage features company Why statements ‘The PPD Difference’, Who We Are, and Our Values sections…it doesn’t get more authentic than that! When most business owners think about using the Internet to help their bottom line, they generally focus on search engine optimization – being discovered through major online search engines like Google, Bing, and Yahoo. Since the advent of Google in 1998, and continuing well into the modern days of the maturing Internet we enjoy today, developers have been able to use various tactics such as back-end programming techniques to ‘trick’ major search engines into ranking their website higher than a competitor’s. For years, even continuing today, developers and agencies have made a fortune selling traditional ‘SEO Optimization’ offerings to customers, but the effectiveness of their solutions have experienced sharp decline. Why the decline? Great question. The world of online search has long been dominated by Google, and the industry pioneer reported having 67.5% global market share in April, 2014. This means that when Google makes a change to the way their search engine algorithm functions, everyone should pay attention. Since the release of Google’s Hummingbird algorithm in August of 2013, and continuing with the Panda and Pigeon updates of 2014, modern online search mechanics have changed significantly in ways that require action if businesses hope to establish, retain, or improve the Google PageRank of their company website. As Google continually reshapes the online search landscape, they are innovating in ways that are intended to support a better overall Internet by benefiting those who regularly manage, maintain, and post new content to properly engineered websites. Now, I don’t know about you, but I think this is great news since I prefer the best websites and most accurate items are featured highest within results when I research using the web. To have success in today’s ultra-competitive world of online search, you must start by having a strategically engineered website designed with modern search mechanics in mind. Pair this with a simple content creation strategy to grow the site over time, and leverage blogging, as well as online social media channels, to help stake your claim in cyberspace. MJGuilfoyle LLC is a Portland, Oregon-based strategic web agency specializing in WordPress website development and online presence management services for small businesses. If you are someone managing a dated website, or if you currently pay someone to perform traditional SEO services, please contact an MJGuilfoyle Technology Strategist today to review the online health of your brand. I’m often asked why I do what I do, and what inspired me to found this agency. As a service-oriented person, I’ve always enjoyed helping others. And I’ve been privileged to have enjoyed the opportunity to collect valuable insights while collaborating with business owners, team leaders, and customers of all types in a career spanning almost 20 years in various roles forming strategies to build businesses from every angle. From my vantage point, I observed a void for most small businesses and many startups – they lacked exposure to trusted technology advisers. These folks were tired of being burned by technology service providers who promised results while delivering little to no value, and they were losing quite a bit of money while collecting a large amount of technical debt along the way. My goal in establishing this agency is to fill the void of trusted technology adviser for our clients, establishing long-term relationships while restoring faith in Internet-related solutions each time we help a brand thrive online. MJGuilfoyle LLC provides enterprise-class WordPress website development and Online Presence Management services strategically engineered for our ideal customers – startups and small businesses. Our philosophy is simple – the success of our clients fuels our own, and everything we do starts with strategy. We look forward to serving your business as a member of our exclusive family of brands.